In this chapter, Foucault illustrates the shift in the Middle Ages between how people dealt with lepers (mass confinement) to how they dealt with the plague (confinement in segmented, observable spaces), and then he draws a parallel between the shift in confinement methods in prisons to the rise of modern disciplinary institutions, such as prisons, schools, and hospitals. Foucault discusses Jeremy Bentham’s Panopticon, which is an architectural embodiment of the abstract concept of the Panopticon, based on Bentham’s belief that power should be visible yet unverifiable. This unverifiable surveillance, both in Bentham’s structure and in the abstract idea, is an efficient, economic and exercisable power that makes discipline possible. Foucault discusses how the panoptic discipline mechanism evolved during the seventeenth and eighteenth centuries through the functional inversion of the mechanisms, the swarming of disciplinary mechanisms, and the state control of disciplinary mechanisms. He ends by sketching the role of the panoptic mechanism in societal contexts: economic processes, juridico-political processes, and scientific processes. There were two words that kept popping into my head as I read this chapter: Bureaucracy, and Lost. First, Bureaucracy. On page 207, Foucault says that the “panoptic machine” is under no risk of degenerating into tyranny and that it will be democratically controlled. I struggled at first with this claim. I couldn’t help but think of movies like Cool Hand Luke and Cuckoo’s Nest, and I wondered how Foucault of all people could be so idealistic as to claim the panoptic machine could never degenerate into tyranny. But as I thought of it, I realized that tyranny and abuse of power are two different things. Here, Foucault is talking about tyranny as despotism, dictatorship, or monarchy: where one person has the power—and as we read on the next page, panoptic discipline doesn’t exist in the spectacle of regal power, but in the realm of exercisable, reciprocal power found in the “relations of discipline” (208). Like our modern bureaucracy, there are checks and balances, there is public accountability, and there is a web of reciprocal power that prevents any one person from becoming a tyrant. At the Sheriff’s office, for example, if we want to change a policy on, say, the use of tazers, there is a gamut of bigwigs (and little wigs) who have to give the OK: the city council, the commissioners, the Sheriff, the captains, the EMS supervisor, the ombudsman, etc. etc. etc. In Bentham’s panoptic structure, the person in the tower isn’t judge, jury and executioner: he is just one part on a bigger machine. His role, in this case, is that of observer, and while he might express a great deal of power or control over his subjects, his power isn’t ultimate. As we read in previous chapters, we know that Foucault believes power isn’t a static “thing” that a person can possess—it is in a constant state of flux: it is reciprocal, and it is always shifting. Power is exercised, not possessed. The tower worker, like the Sheriff or council-member, is only one of many cogs in this machine that exercises what power they can, but it is a constant game of give and take. Similarly, in our discussion on Tuesday we talked about how everyone is supervised. Everyone. Even the guy in the tower. It made me think of my Dad’s situation. He is the CEO of a company that supplies doctors to St. Al’s. He is the doctors’ boss: he writes their contracts; he signs their paychecks; and so on. At the same time, those doctors are his boss: they write his contract; they (collectively, not individually) are the ones who can give him a raise or fire him. So there’s a weird, reciprocating exercise of power (and surveillance) between all of them. 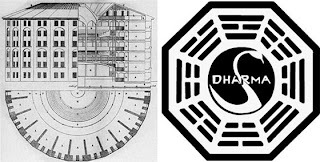 I Googled “Panopticon” and “Lost” and found that I’m not the only one who noticed this: apparently there is a whole online fan community who share there theories about what is going on in Lost, and a lot of them subscribe to the idea of the Dharma initiative being a government-run Panopticon. One fan points out an episode where there’s an obituary or tombstone (or something—he was a bit vague about it) that said “Je …ntham” on it, which he says is proof that the show is based on Jeremy Bentham’s Panopticon. I don’t know that Lost really has any bearing on Foucault’s argument, but I keep a journal of movies and TV shows that I think would be good for teaching a principle (such as clips from Almost Famous or Capote in my ethics-of-representation discussions), and I think some clips from Lost would be a good way of illustrating the Panopticon, both as a physical embodiment (a network of surveillance cameras), and as an abstract concept (the feeling of always being watched and how it effects their behavior, even before they know about any cameras).